Perhaps it is well to have further discussion of the inscription on Blake’s sketch: see David Bindman, “The Dead Ardours Revisited,” Blake 56, Spring 1981, p. 211, querying my “Leonora, Laodamia, and the Dead Ardours,” Blake 54, Fall 1980, pp. 96-98. Bindman and I have both examined the original sketch, in his collection, while the photograph of it as reproduced in Blake 54 has given people a wretchedly faint image to examine. Here, with better reproductive results be it hoped, is a re-photographing on high-contrast paper, giving much sharper definition. W B. The dead ardours Perry David Bindman Collection. 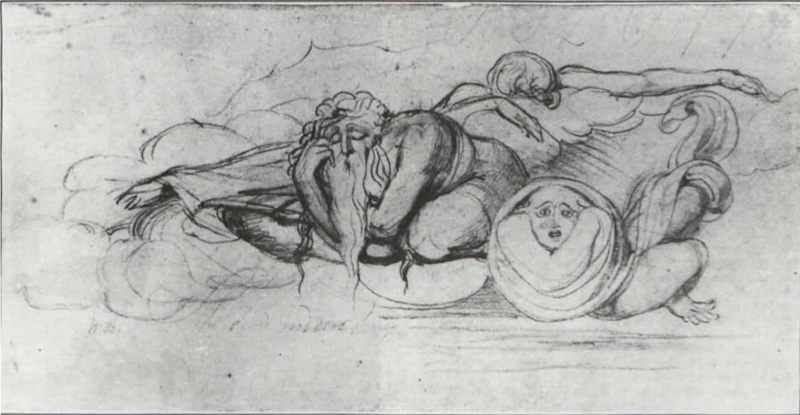 I find it hard to conceive of anything that would more powerfully connect this design with the design which Blake made and Perry etched for Leonora (see plate 380 in Bindman’s Complete Graphic Works of Blake) than the striking resemblances between the “dead” somethings in this sketch and the “Forms” “of Death” (according to line 2 of its inscription) in that plate that was etched and published. To Blake, Perry need not have been “an obscure engraver” even though he was a bad one and we may suppose that Blake disliked, not his obscurity, but his ugly transformation of Blake’s faces and bodies with his stippling deconstruction. That the word I have read as “Perry” might rather be a word integral to the caption, as Bindman implies, seems to be ruled out by the nature of the caption as a mock-up or layout, something I alluded to before but have now given closer attention to, thanks to the questioning. Lettering, in a design plan, is not inscribed but positioned. Bindman makes no note of the letters “VOLUME” which have been partly cut off but are visible in the upper left portion of the sketch. It will be left to a lettering engraver to inscribe that half-title. And even the caption itself, far from being all in “Blake’s own formal script,” is approximately formal only in the opening “The” and the second and third “d”. The smaller letters are only roughly indicated, to lay out the spacing, if later revised a bit for legibility. In short, this is not a finished inscription but a mock-up for an engraver to follow in his own style. In the three stipple engravings actually used in Leonora it seems evident that the identifying phrases “Blake inv:” and “Perry sc:” in the corners of the plates were not inscribed by Blake: quite possibly they were not inscribed by Perry either but by a specializing lettering engraver. Thanks to David Bindman’s query, I can now see that the “P” of “Perry” is rather more like the “P” as engraved in the published plates than it is like Blake’s—though, pace Bindman’s other viewers of the original sketch, nothing like a formal “L” can be seen here. The letter is a formal “P” in the style of copperplate hand employed by Blake (see “O Prince” for a flourished example, in FZ 38:15) as well as in that of the lettering engraver. Why should “Perry” be crowded up so against the last word of the caption, and too close for a properly flourishing “P”? And why “W.B.” put off toward the left edge? I take it that although the caption itself had to be carefully spaced and its style indicated, the placing of the names would depend on the final shaping of the plate. They were simply jotted here, by Perry or by some foreman, as reminders. If the design were used as a vignette under “SECOND VOLUME” (to guess at a number) it might float as a cloud above blank space and the names be tucked inconspicuously under the corners of the cloud: compare Bindman, plates 381 and 382. As for the caption itself, however, infrared photography yields no trace of any letter where Bindman hesitantly conjectures (and abandons) a “b” for “bard.” But “ardours” stands out even more clearly than “dead”; the pencil mending Bindman mentions I take to be Blake’s turning the sketch into setting-copy, so to speak. If the New Mexico printer doesn’t now betray us, I think no one need worry further about this transcription. David Bindman, however, has generously invited the curious to consult the original. And what next? Perhaps someone working in publishing history will discover what aborted Volume these ardours were intended to adorn.